DENVER — One P.E. teacher is making a world of difference for his 5th grade class, not only teaching them how to snowboard in the school gym, but taking the entire class to local ski resorts to teach them how to do the real thing. “I really just wanted to open them up to this lifelong activity that they can do and it’s right outside their doorstep,” teacher Chris Atkinson said. Atkinson is the one and only P.E. teacher at Schmitt Elementary, a Denver Public School. He’s also a lifelong snowboarder, who was surprised to learn that the sport (as well as skiing) wasn’t included in the curriculum. So he made it part of the curriculum. “We found an organization through Burton called Skate Pass where we got all of this equipment,” he said, pointing out foam boards and balance equipment which was donated to the school for educational purposes. Atkinson runs his 5th graders through various drills in the gym to expose the kids to the sport and see if it sticks. “Skiing and snowboarding isn’t for everybody. We just wanted to give them a taste so they have the opportunity,” Atkinson said. But this very Colorado form of physical education doesn’t stop there. Chris wanted to take the kids onto the mountains to teach them for real. That’s when he found Colorado Ski Country. “That offers free skiing and snowboarding to every 5th grader in Colorado, they just have to get signed up,” he explained. So he signed his class up, and started fundraising to pay the remaining costs of rentals and transportation. He told Denver7 the school did bake sales and more to try to send the students to the mountains for a day. “It’s been really amazing, everyone coming together to get these kids up to the mountains,” he said. The fundraisers were successful. To date, the 5th graders from Schmitt have gone skiing or snowboarding three times. “A lot of them would probably never get up here. They might not have the means to get up here, they might not know what skiing or snowboarding was all about,” Atkinson said from the base of Loveland Ski Area. On Thursday, he and a few other teachers brought 16 students to Loveland to ski or board. It was the very first time for a few students, a few others had already picked up the hobby. 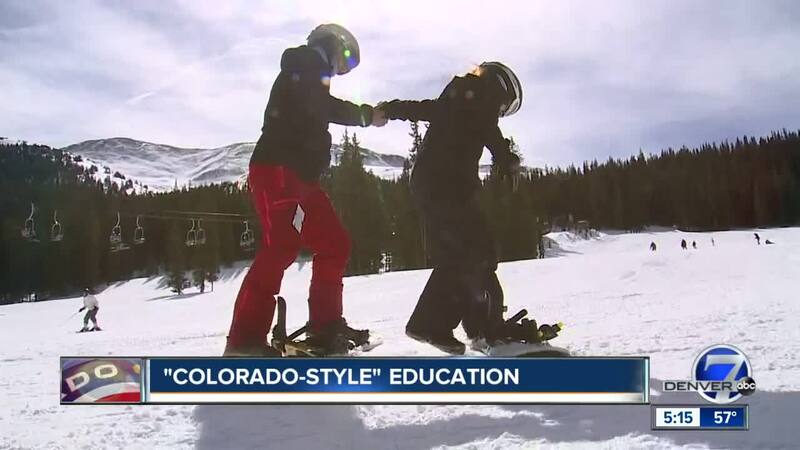 “It’s great to see the kids actually get out on snowboards and skis and work on the skills we learned in the classroom,” the teacher said. Atkinson said he’s already looking forward to next year and hopes the interest level in the program continues to grow.